Osmo Decking Oil is a Satin, natural decking oil based protective finish for exterior wood, available for clear and coloured decking. It can be used to maintain wooden decking, garden furniture and screens made of numerous coniferous and fine woods, e.g. pressure impregnated Pine, Douglas Fir, Cedar, Oak or Bangkirai – also suitable as a transparent coloured treatment of Teak, Eucalyptus and other fine woods as well as thermo treated wood. 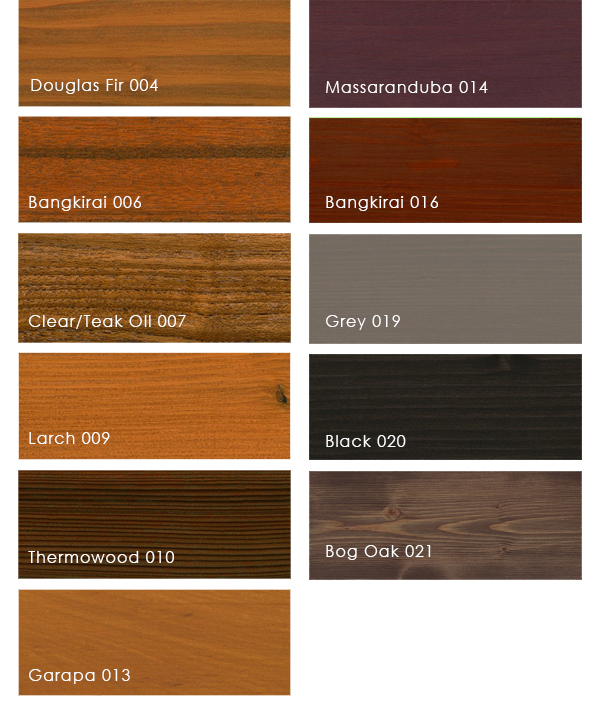 Osmo Decking Oil is available in 11 different decking oil colours (see Right) - The most popular colours apart from clear oil, tend to be a dark decking stain like black decking stain and grey decking oil. PLEASE NOTE Clear/Teak oil 007 is colourless and has no UV protection, allowing the treated wood to grey naturally. Hardwood with a high content of natural wood extractives needs to weather off (for at least 4 weeks) before the initial treatment or to be cleaned with Osmo Brush Cleaner and Thinner (degreaser). Resinous wood e.g. Larch or Douglas Fir needs to weather off for at least 6 weeks. Pressure-impregnated wood, Massaranduba, Bangkirai or Garapaneed needs to weather off for at least 3 months. content max. 20%). Osmo Decking-Oil is ready to use – please do not thin. Stir well. sides, with one coat of Osmo WR* Impregnation. The finished surface is, among other things, influenced by the wood’s natural characteristics, therefore a trial application is required before finishing. * Use biocides safely. Always read label and product information before use. Use a stiff brush or a lint free cloth (e.g. for furniture) and apply thinly and evenly to the clean and dry wood surface along the grain. For a quick and easy application, we recommend using Osmo 150 mm Floor Brush which was tailor-made for decking and allows you to apply the finish while standing. Apply thinly and evenly. Allow for good ventilation while drying. Then apply the 2nd coat – also thinly. Areas that have worn can simply be refreshed by applying a fresh coat. Areas with damage such as scratches can be repaired with a light sanding and re-application of the oil. Osmo Decking Oil product information datasheet. Osmo Decking Oil Safety Data. Click the button below to add the Osmo - Decking Oil to your wish list.